Interior bird issues can escalate in the winter as birds seek the warmth of buildings through open doors and structural gaps. The time to initiate a bird management plan is not when the house sparrow flies through the door. When a bird makes its way inside a food facility, its origins frequently are traced to the conducive conditions around the exterior of the facility, which support bird populations. Here are some recommendations from South Elgrin, Ill.-based McCloud Services on strategies for protecting your industrial and commercial accounts from birds. It’s not impossible to get a live bird on an incoming shipment, but it is highly unlikely. Typically, the facility “owns” the bird; it has been nesting, loafing or feeding on the exterior of the plant. Performing exterior bird management is a critical component of preventing indoor occurrences. Reduce the conditions that encourage birds on the outside to reduce the interior risks. To start a prevention program, the exterior of the facility should be inspected at least monthly, checking for bird activity. Look for evidence of pest birds such as droppings, feathers or nesting materials. Focus inspection efforts on finding those conditions, which can provide food, water and shelter. Also, inspect for access points such as openings around dock doors and dock levelers. The inspection must cover all areas of the plant exterior, including ground level and roof. Use the information uncovered in the inspection to further educate staff and correct conducive conditions. Food is one of the major attractions for birds. Food spillage around dumpsters, silos and rail unloading areas are some examples of where birds may find food. Establishing regularly scheduled clean-up is essential. Roofs and product accumulations in these areas should also be checked. Roof areas can be difficult to clean, especially if there is a gravel layer on top of a membrane roof. Yet, product can be present in these areas through equipment malfunctions. Inspect both high and low for food sources, and eliminate them. Water sources will also attract birds and provide an essential need for survival. Birds need a readily available source of water. Parking lot potholes and poorly designed drainage systems are common ground level sources. Puddling of water on roofs is another common source that should be eliminated whenever feasible. The last conducive condition is harborage. 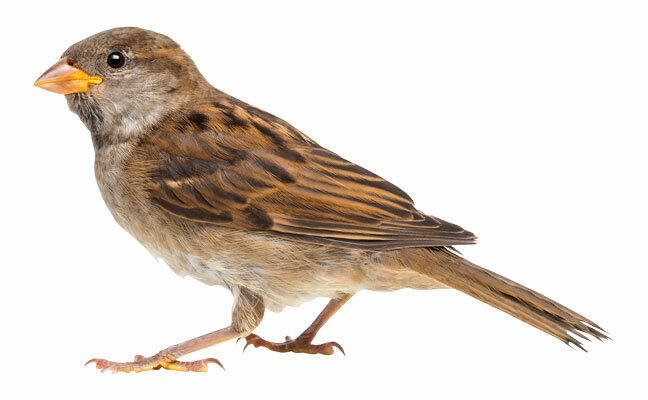 Pest birds like the English house sparrow will readily build their nest in structures like gaps in exterior walls. Pigeons will seek harborage on ledges especially when there is some cover provided over the ledge. Inspecting for these nesting opportunities, and then sealing or using bird management exclusion devices, are needed. Bird netting is often used to exclude nesting areas like those found underneath overhangs and canopies. Landscaping should also be evaluated for its impact in providing nesting or resting opportunities. Although some municipalities may place certain requirements regarding landscape choices, trees with dense foliage and cover should be avoided. Consider pruning trees and shrubs to reduce attractiveness. Removal of the problematic vegetation may be the best solution where possible. Inspecting the building for openings, which are vulnerable to bird entry, is another important survey function. This includes, doors, windows and vents which do not seal properly or are intentionally left open. Educating employees regarding the importance of keeping doors closed and correction of structural deficiencies is also required to keep birds out. On occasion, there may be more extensive door or system modifications needed to assist with bird exclusion. For example, if a facility receives routine deliveries from a panel-style truck through a standard dock door, there will be large gaps between the top of the panel truck and the dock door. Dock doors are designed to accommodate and seal a much larger truck. Special receiving doors may need to be designed or designated for the smaller, panel-style truck. Despite the best efforts at prevention, birds can still get in and require immediate attention. The first step is to minimize risks to food safety. This means trying to isolate the bird from any exposed food or food contact surfaces. For example, keep all doors leading to packaging and production closed. Birds can carry a variety of pathogens including Salmonella. It is critical to keep highly mobile pests away from production areas. Next, use light management to try to encourage the bird to leave. This means turning off the interior lights and opening the doors. Laser guns or noise can be used to help move the bird towards the open doors. These procedures should be done as soon as the bird enters. It is important not to let the bird become acclimated to its surroundings. If the bird becomes comfortable, lights and harassment strategies will be less successful. If attempts to get the bird to leave on its own are unsuccessful, trapping or shooting will be required. Mist nets are the most common method used to live trap and remove a bird. Nets can be installed on a permanent basis or rotated to areas based on the bird’s flight pattern. Either way, it will take time to observe bird movement and flight patterns. Use nets where birds are routinely flying and where subdued lighting may help hide the net. Birds will avoid nets if they can easily see them. Most nets are black in color but different color nets are available. Use a net that will be least visible in the surroundings in which it is placed. In some cases, multiple nets may be required to cover normal flight paths and potential escape routes. Mist nets require time and skill to be effective, and they must be constantly monitored to ensure that captured birds are removed promptly. Before selecting a trapping or shooting method, consult state and local regulations regarding any applicable firearm ordinances or trapping restrictions. For example, safety concerns must be addressed when shooting birds with a pellet riffle. In addition, some plants may have their own restrictions regarding the use of firearms on site. Many species of birds are federally protected, in which case they must be identified to ensure that whatever control method is selected will meet all legal requirements. English house sparrows, and European starling and pigeons are not federally protected from the use of lethal control methods. All animals need food, water and shelter. Establishing a program to inspect and eliminate these elements for survival will help reduce both interior and exterior populations. Patricia Hottel, BCE and Technical Director of McCloud Services.